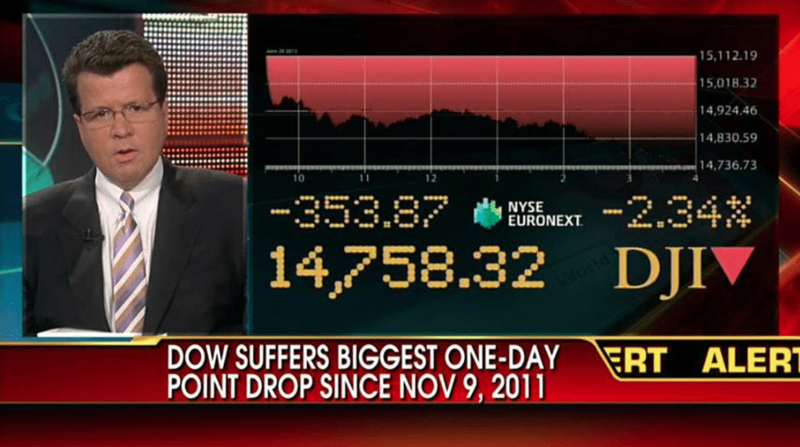 I have received a large number of emails over the past few days about the stock market’s recent drop. My Thrift Savings Plan investing strategy is such that I ignore minor blips such as these, except to marvel at the how clever Wall Street is in encouraging meaningless volatility which, of course, is to their benefit as they trade ahead of the public both on the way down, and on the inevitable way back up. I do not try to trade these events, because by the time you recognize that one is occurring and get out of the market, it will have turned and you will have locked in your losses and missed the recovery. While I will not typically bother discussing a minor event such as this, I thought it was worth explaining how I view these episodes and why they play no role at all in how I determine my Thrift Savings Plan allocation. When I get some more time I will expand this post to cover what finance types call “discrete events”, which, no matter how horrific and newsworthy, almost never have anything more than a very short term impact on the market. You had to go to the fine print to see that the calamity they were referring to was limited to the DOW’s largest decline in 2013. This has been a very good year for the market, so it was a fairly unremarkable drop and it stood out only because the DOW (and the broader market) have done so very well this year. I predict that there will be several more “biggest drop” stories this year, none of which will have any long term impact on the market or my Thrift Savings Plan. There were several front page stories in the press about interest rates rising in China and the difficulty that businesses were having getting loans, with talking heads pushing the notion that this was somehow going to result in China’s crash and a global economic meltdown. While China no longer has a command economy, interest rates and money supply remain strictly controlled by the central government. When Beijing wants interest rates to go down, they will go back down in very short order. Another non-story for Thrift Savings Plan investors. Finally, the stories about the Federal Reserve starting to merely discuss the tapering off of Quantitative Easing hid great economic news under several layers of speculation about what impact that might have on the markets. Quantitative Easing means that the Federal Reserve is currently printing and pumping $85 billion per month into the US bond market. The Fed is buying agency-backed mortgage securities (Ginnie Mae, Fannie Mae or Freddie Mac) and Treasury securities to artificially hold interest rates low in an effort to stimulate growth. The reason that they are going to start tapering these purchases off is because the economy is doing well and no longer needs that crutch. In a release about the Federal Reserve Bank’s Open Market Committee meeting, officials predicted three percent GDP growth in the U.S. economy in 2014, low inflation, and a reduction of the unemployment level to six percent by the end of 2015. That is great news, and shows that the US economy is still solidly in recovery for my purposes in determining the best TSP allocation.